No one needs to feel the pressure of waking up with the bakers to get a scrumptious breakfast. This is easy to prep the day (or two) before and easy enough to throw together before you’ve had your morning coffee. I started with Skinnytaste’s recipe and spiced it up a bit with the help of Trader Joes – sundried tomato chicken sausage, sweet orange and red peppers, broccoli, cauliflour, leeks, and half an onion. I chopped the veggies + cooked the sausage two days before cooking the bake because I knew I wouldn’t have time to do any closer to time. I stored it in a large tupperware container and simply sautéed it the morning, mixed the egg mixture and threw it in the oven. Easy peasy! 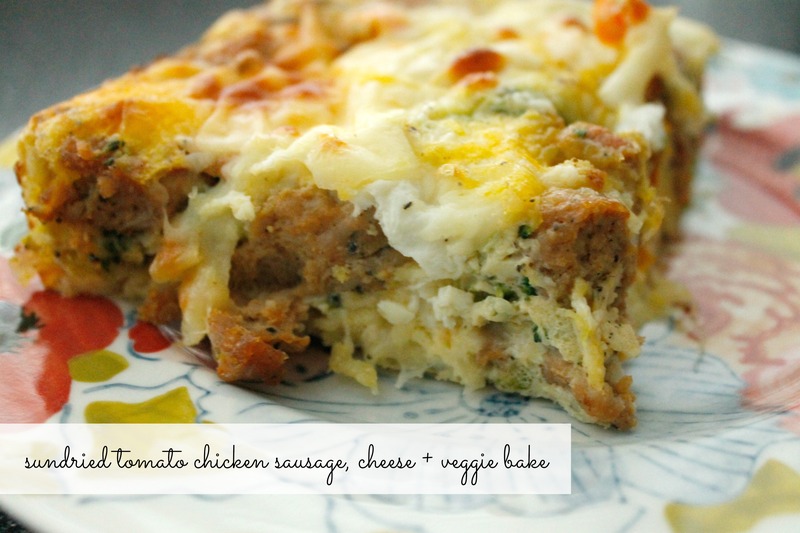 Categories: Good Eats | Tags: Breakfast, chicken sausage, easy recipe, egg bake, scrumptious breakfast, skinnytaste, Trader Joes | Permalink.